Continuing along the River Walk, you will find yourself on the newly installed Cliff Walk. 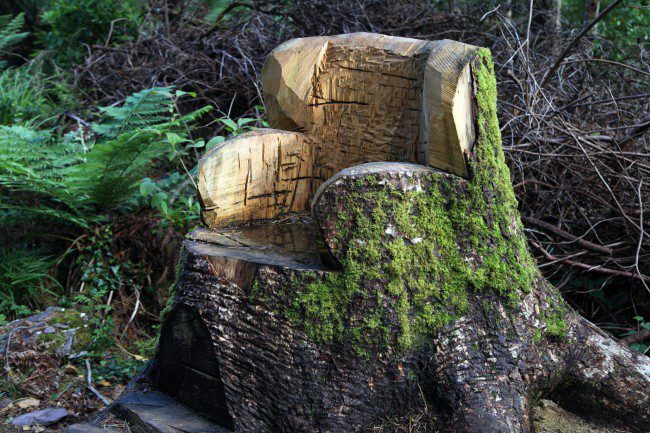 This was completed in the winter of 2009/2010 by Coillte and formally opened by Ronnie Delany on Friday 23rd April 2010. This is primarily a new route enabled by the clearing of tracts of the invasive plant Rhododendron ponticum supported by Coillte in works carried out in 2008. This pathway is new and planting are mainly recent ones however it opens up terrific new views of the mountains that surround the gardens (Foley’s Mountain and Cnoc na dTobar) on the early stage of the walk and of Dingle Bay later on. There are a couple of benches conveniently located at prime viewing points. You will also find a White Way Marker that will direct you down to the viewing platform over the Gunnera Pond. This vast new area will be used over time for planting of large areas in primarily Chinese (Yunnan Province) and South American flora. Footnote: The recently sculpted armchair (2010) by, Pieter Koning, is extremely comfortable. 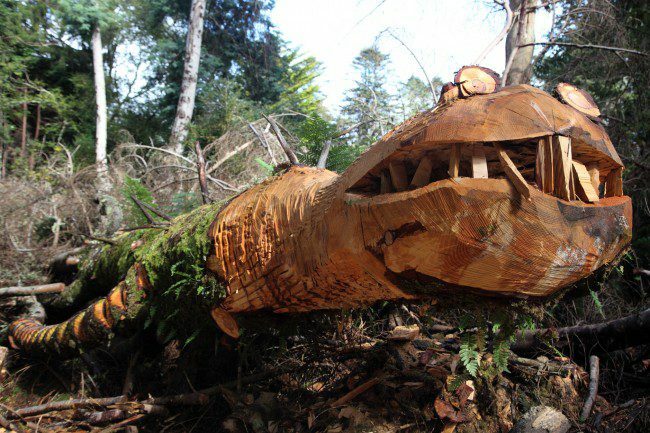 This was carved out of a fallen Abies grandis, another victim of the January 2010 storm. It has been named, Contemplation! Please take a seat, lean back and look up to the sky. Also the first of the Kells Bay Gardens Dinosaurs will greet you in this area, another creation by Pieter Koning from a fallen tree (2011).